New New New, There’s So Much NEW! I know I have commented in the past that some years are sparse as far as new varieties and other years are bountiful. This year is not just bountiful, but crazy, new varieties coming out of our ears and every other cliche in the book crazy. Part of it is that there are a number of tomato varieties that have been kicking around for a few years but the breeder seems to have released them more generally to some of the big name catalogs now. So, I am probably going to do several posts over the next month or so highlighting some of the new things that have piqued my interest. The problem is there are so many cool things out there, that I don’t want to just rehash each catalog entry! I’m going to be challenged to only write about my favorites. Of interest to those of you with small yards that love plums, this variety, ‘Japanese Burgundy’ claims to be self-pollinating and columnar. Might be interesting to try. Do you love to grow ‘Early Girl’ tomatoes? Well, this variety, ‘Summer Girl,‘ is supposed to be earlier and bigger. I’ll have some more new varieties to talk about after Christmas! This fall, one of our Master Gardeners brought in a cluster of tiny, Peruvian cherry tomatoes they had grown from seeds they had been given. I decided to save the seeds to have for later. Here’s what I did. First, you cut the tomatoes in half across the middle, and squeeze all the seeds and the locular gel out. I typically add a few tablespoons of water as well. Then you cover with plastic wrap and let it sit in a warm spot for 10-14 days. 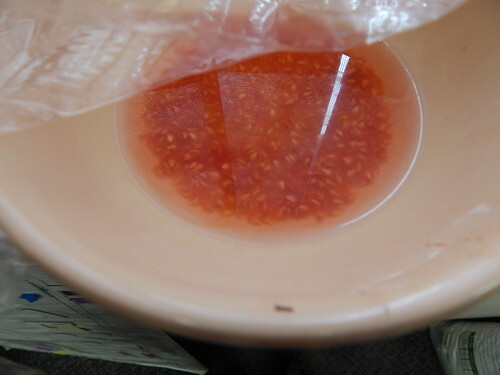 The reason for this step is that the seeds are encased in all that gel, and you need to get rid of it. Unfortunately, I either neglected to take a picture (or have misplaced it) of the next step. This is the part where the top of the seeds are covered in really cool looking fuzzy fungus. 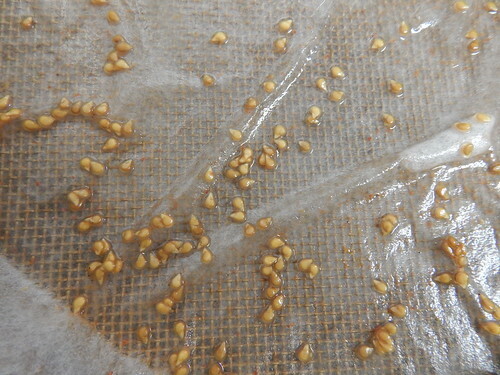 If you don’t know that’s supposed to happen, you might freak out and think your seeds are ruined! It’s okay! The fungus is eating up the gel and also chowing down on any pathogenic bacteria or fungi that may have been hanging out in the fruit or on the seeds. Then you scrape off the fungal goo from the top of the mixture. Next you rinse the seeds and strain out the water. I used a coffee filter over a mesh screen that we had. You could also use a sieve of some sort. Most of the gel is gone and the seeds are clean. 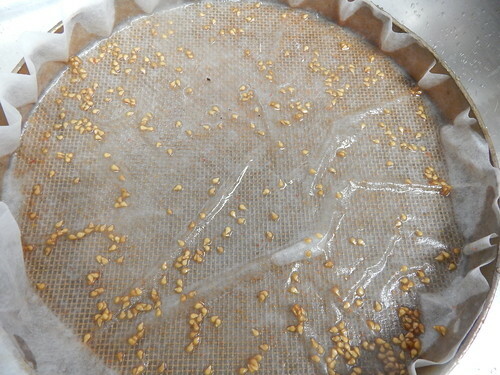 From there, it is just a matter of spreading the seeds out and letting them dry for a few days. The seed should not feel damp to the touch when you bag it up. Make sure you label the package! Be sure you make sure you store the seeds in a cool, dry location. 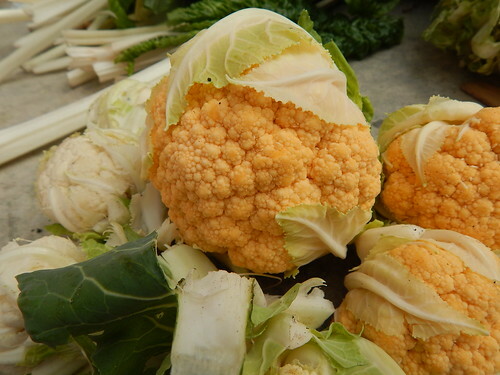 Over the weekend, I read a post on one of the gardening blogs I follow (The Veggie Patch Re-Imagined) about another blog all about growing uncommon root vegetables. I was familiar with some of the roots/tubers mentioned (oca, mashua, mauka, etc) from attempting to grow them at a previous job. (I left them when the plants were still babies.) So I emailed myself to check out that blog this morning when I didn’t have to use my phone to browse. From there, it was a quick trip down the garden blog rabbit hole. I found about a dozen new blogs and websites to follow, and because I have no sympathy for your needs to not spend time browsing the internet, I’m going to share them with you. So as a word of warning, if you don’t have at least an hour to spend browsing garden sites, please stop reading now and go do something else.